Managing two blogs is akin to sailing in two boats. I know many bloggers do it with ease but I guess I am not adept at multi-tasking. I do not want to give up either, I would like to take this blog to its logical conclusion, no matter what it takes, therefore those of you who have been supporting me with your comments and visits, I request you to bear with me for I cannot help the long intervals between my posts. 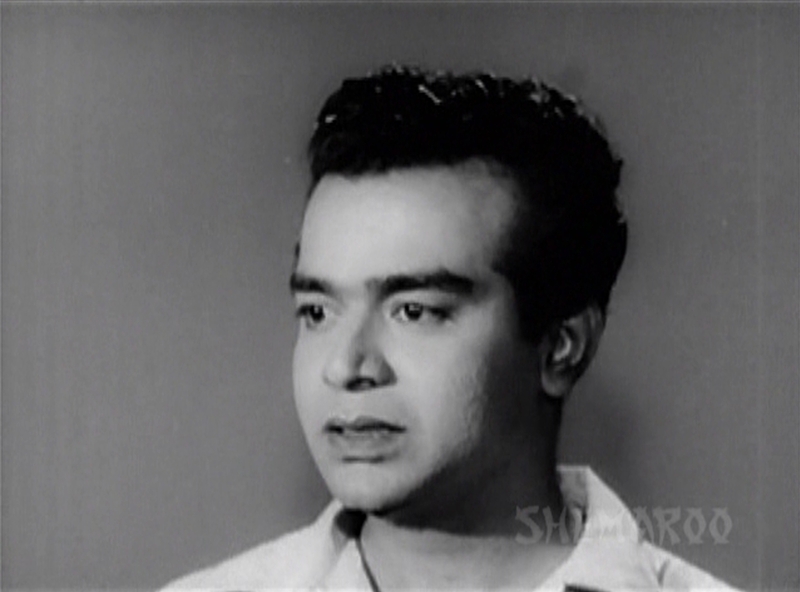 Continuing the Sujata story, I would like to show you how well Bimal Roy handled children. There are very few directors who present children in a heartwarming manner. Children in Hindi films are sometimes quite precocious and made to mouth high flown dialogues, what gets on my nerves is when they are made to deliver silly dialogues like, “Woh badmash uncle” (that bad uncle). I have yet to hear any child referring to a bad person as bad uncle. Bimal Roy presented children in all their innonence. It was evident in Do Bigha Zameen. The scenes between Jagdeep, who was then a child artiste and Rattan Kumar were very endearing. You can see it here it begins at approximately 5.17. Likewise take a look at this clip from Sujata and judge for yourselves. It opens with Sujata (Baby Shobha) and Rama (Baby Farida) laughing and enjoying themselves on the see-saw, laughing and giggling as kids do, this joy is then followed by a childish quarrel so typical of children who are friends one moment and foes the next. Finally I also loved the way he captured the birthday sequence of infant Rama. It is not the typical song and dance sequence but various elements and incidents have been strung together to show the general sense of joy of a young couple celebrating their infant child’s birthday. 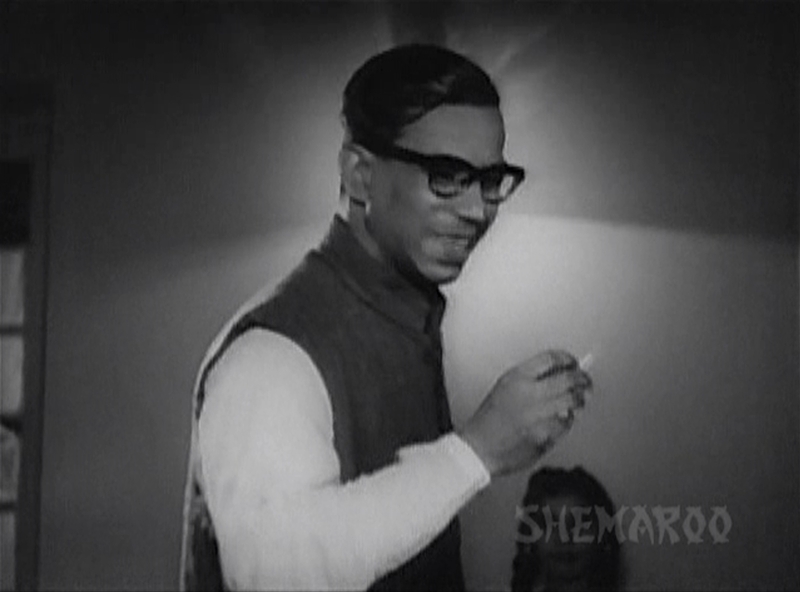 There is this absolutely delightful shot of Master Shahid (at least I think it is him) enjoying an ice-cream. Then there this amusing scene where you see this gentleman quietly enjoying a smoke. Just then Charu (Sulochana) comes over and talks to him, startled out of his reverie he moves his hand and a balloon bursts. Note the child's expression,this child later bursts into tears at the sudden sound of the balloon bursting. While little Shahid has a good laugh, note the ice-cream smeared all over his face. In the meanwhile the gentleman in question is embarrassed. Actually I could go on, picking out various such scenes but I think I should call a halt and go on to my trivia section. I begin my trivia section with the scene above. 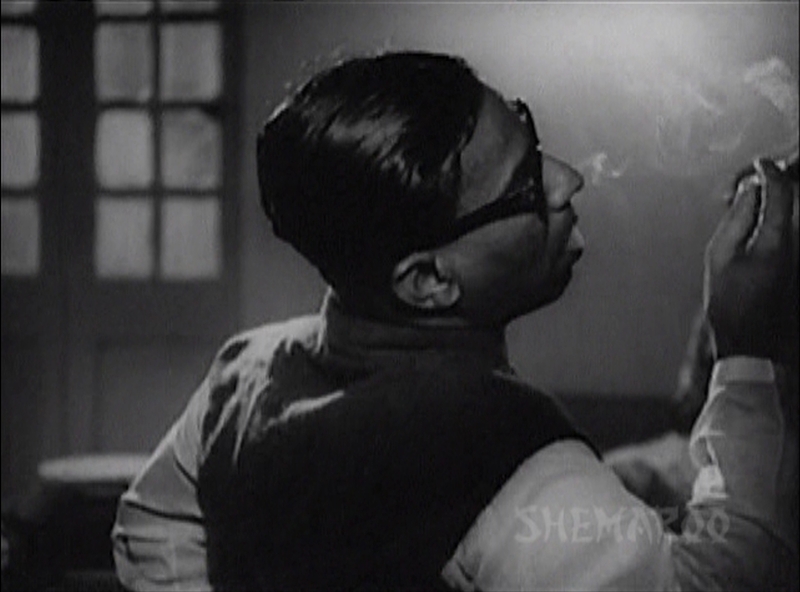 The gentleman you see in the above mentioned scene is Nabendu Ghosh the film’s screenplay writer. 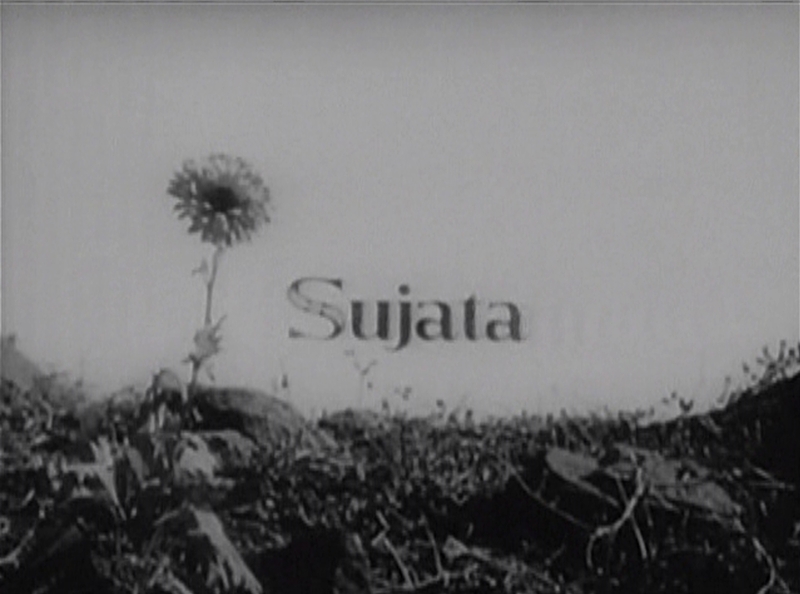 In the film’s credit titles you see a sunflower, it features later too in the film, the sunflower symbolizes Sujata. 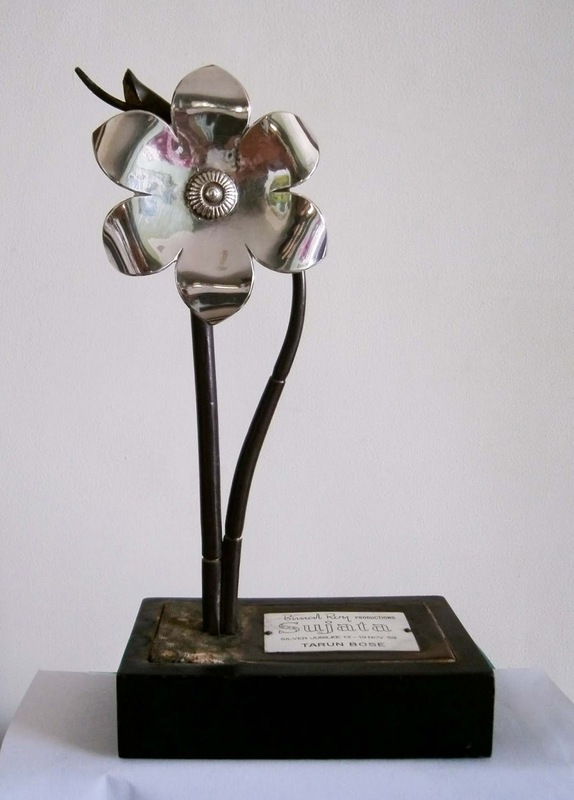 Therefore the film’s silver jubilee trophy is also a sunflower. Incidentally I feel silver jubilee trophies should now be placed in some film museum or something similar, because the days of silver jubilee, golden jubilee and diamond jubilee are long gone. Nowadays it is all about the 100 crore club. Back then film personalities had to provide space for their trophies in their homes. Sometimes producers would withdraw their films from the cinema halls in the 24th week just so that they did not have to spend money on the silver jubilee function and the trophies. There would later be a re-run of the film, so neither the producer nor the exhibitor lost money. Nowadays few films are shot on location in Mumbai but back then filmmakers made good use of Bombay (it was Bombay then) as a backdrop to tell their story. While in Delhi you see the remnants of the Mughal rule (well not just the Mughal’s there are I think some ruins from the period of previous rulers too) in Mumbai you see monuments and buildings from the Portuguese and British periods.The screen cap from Sujata below is that of the Town Hall. A beautiful piece of architecture that reminds you of the Parthenon, the Asiatic Society Library is located here. This library is a treasure trove for book lovers. I read somewhere that Dr. Chandraprakash Dwivedi did most of his research for his serial ‘Chanakya’in this library. This lady above is supposed to be Sujata. She is seen here walking in the rain, very upset after learning that she is not Upen and Charu's child but the child of a humble, untouchable worker. However the lady here is not Nutan but a background dancer who doubled up for Nutan. 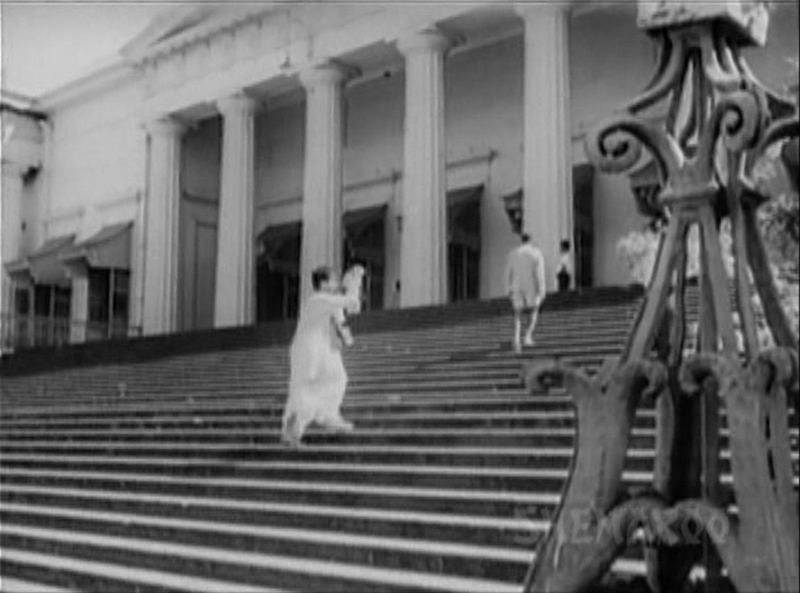 Finally do you see my father in this scene from Sujata? Notice he had a full head of hair but as the years went by he started losing hair, it is quite noticeable in his later films, obviously in those films where he doesn’t wear a wig. With this I end my Sujata story. 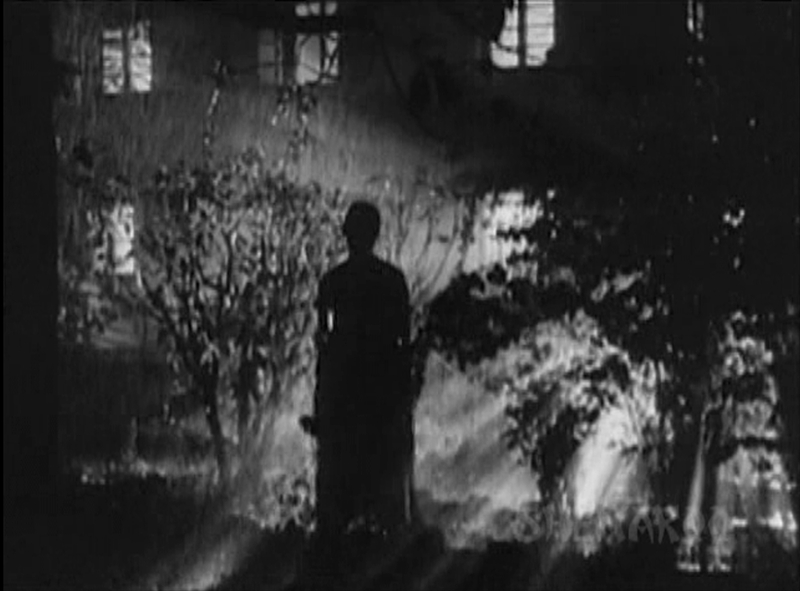 My next post will focus Madhumati. Dear Shilpi, you could have carried on ahead with Sujata, I wouldn't have minded! Very touching scenes there. The small children quarrelling reminded me of me and my cousins! Thanks for all those extra anecdotes. Particularly the one about Nabendu Ghosh! It was great fun reading it! Yes Harvey aren't those scenes heartwarming. Glad you enjoyed it. Shilpi , you once again you have done G8 justice to Bimalda by highlighting some of the important scenes which otherwise one would not have noticed it with the deep insight you have now exposed us to. Thanks for d same. Njyoed . Yes waiting for Madhumati to role. Highlighting scenes that otherwise would have gone unnoticed is really the purpose of this blog. You have not only done full poetic justice to the memories of Tarun Bose, the actor, but also to several soft aspects of 'Sujata' as a film. We are quite sure you must be thoroughly relishing re-living those moments with your father, when you must be thinking of what you choose to document on these posts. 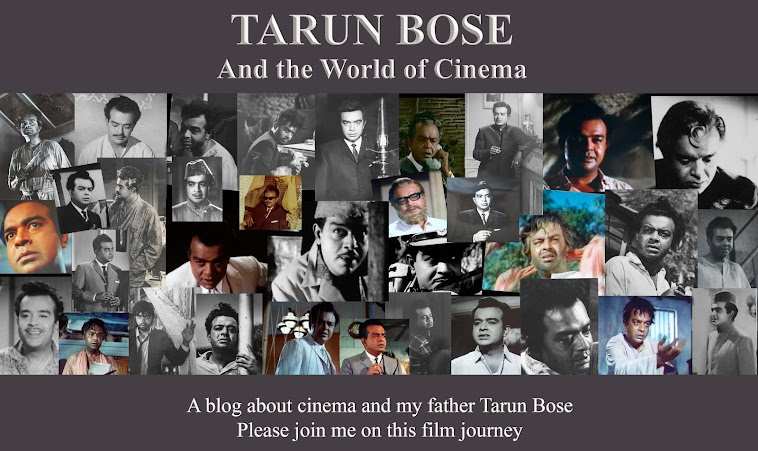 For us, that works out as a very different perspective through which we re-live what we had liked about the perspectives that Shri Tarun Bose brought to the characters he enacted, but also the very intimate glimpses to his own strength of the character that got reflected in his on-screen renditions. Yes, indeed, I am enjoying this, I do get emotional at times but yes it is fun and quite fulfilling. Shilpi, this is wonderful! I love both the trivia section, as well as your observations on the children - yes, they're so believable, not like the rather cardboard-cutout children most directors put onscreen. Madhu these portions are my favourite, I like to watch them again and again. Ash you are so right.Glad you enjoyed it. Lovely. Looking forward to your background notes on Madhumati. Thanks a million Anu.I see other bloggers post at regular intervals and I feel a little restless.Therefore comments like these really keep me going. Thank you. Enjoyable post - as always. I feel sorry that Sujata has ended, but look forward to Madhumati. It's another well loved film (at least by me). A film of one of my favourite actors, Dilip Kumar. I was interested in the information about Dr Chandraprakash Diwedi and his research about the serial Chanakya, because I've seen it, and had liked it. Yes, it's nice to see Bombay or Delhi in the old films. Thanks pacifist,glad you found all the info interesting,I confess sometimes I wonder whether all this will interest the readers or not. When I get such a positive response it lifts my spirits.